About Mauritius, and just exactly, Where Is Mauritius? Mauritius is not just about weddings, honeymoons, and gorgeous beaches !. they just love it ! Water Sports - Family Activity Holidays. "Most land and water sports activities are FREE"
When you book your holiday at one of the resorts mentioned within this site you can enjoy UNLIMITED water-skiing at NO ADDITIONAL CHARGE. Great Family Activity Holidays, where the whole family can enjoy different activities and it's all free, just think of the 'savings' ! - and above all just think of the pleasure and enjoyment leading to an absolutely 'fantastic family holiday'. Is FREE and plentiful at the majority of our resorts, most hotels employ the services of an outside professional company, just go down to the 'boat house' on the beach-front and make your enquiries, lessons, tips and all that you may require regarding waterskiing will be answered by the professionals. Lessons and Instruction by the professionals are available for beginners and those wishing to develop advanced skills. Windsurfing, snorkelling, kayaks, pedalos and glass bottom boats can also be enjoyed many free of charge. Hire a modern well equipped deep-sea fishing boat and it will whisk you full speed beyond the coral reef to deep blue waters just 3 miles off-shore from the Paradis resort. Mauritian waters are famous for their big game fishing and we strongly recommend that fishing enthusiasts pre-book their fishing boats particularly during the Marlin season. With many world records to their name, the Paradis resort has a fleet of aptly named "Challenger" fishing boats, by far the best on the island. From November to April, and very often until May, huge fish like the Blue Marlin roam the seas of Mauritius and hunt the island, where the ocean runs 70 metres deep one kilometere away from the coast. Mauritius holds several world fishing records (IGFA), including that of the mako shark, some 1115 lbs. Explore the bottom of the ocean and coral reefs for some of the most rare species of marine life, see at 'close-hand' the exotic colourful fish and underwater scenes. Dive down to the sea-bed and explore many of the 'shipwrecks' dating back to the old pirate days. Private lessons, tuition, available for those who have never dived before, or advanced lessons for those wishing to develop their more advanced skills, all by the professionals, at resort. Phone for a copy of our scuba diving pack. Diving and lessons are available at all the resorts detailed in this site at a small additional cost. Undersea walks - this novelty activity is becoming increasingly popular in Mauritius and allows non-divers to experience life below the waves. Participants put on diving helmets and lead boots and stroll along the sea-bed touching and feeding the fish in a sort of 'Jules Verne - journey beneath the sea' -. Oxygen is piped into each divers' helmet from the surface station above - and divers are on hand in case of any problems. 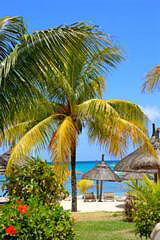 Many visitors to Mauritius rate this adventure as the experience and highlight of their whole trip. Golf clubs are available for hire and minimal green fees are payable at the hotels. All the resorts have excellent tennis facilities with courts available at all the hotels and a professional at most. Whether you are an experienced player or a beginner our tennis facilities ensure that you enjoy the highest standards. Well eqipped and modern gymnasiums are available at all the resorts - except for La Maison where clients may use the gym at Royal Palm.Shandrani has a smaller and less sophisticated facility. You don't need to worry about your teenage children. For those that have boundless energy and an adventurous spirit, there are endless opportunities for them to try all those adrenalin-pumping sports like windsurfing and water-skiing. You can spend time with your children enjoying a fun-filled sporty holiday without digging too deeply into your pockets. Sailing conditions are excellent and there are a variety of lasers or hobicats available at all of the hotels for your use in the lagoon. Windsurfing is very popular on Mauritius - at the majority of our Beachcomber resorts, windsurfing is absolutely FREE. The east coast of Mauritius occasionally and then usually seasonally, attracts the 'trade winds', which in years gone-by, many a sailing ship came to grief by being thrown onto the coral reef in such strong winds - for beginners the west coast is ideal, for the mountains act as a shield against any strong easterly-winds that might prevail - equipment is usually plentiful and fully maintained at all of our resorts. Professional advice and assistance is at hand - private tuition also available. Day cruises and evening sunset cruises on board a catamaran can be chartered and are suitable for excursions aroud the lagoon and into the open sea. For those who like a flutter and want to try their luck at the tables, there is a casino to be found at Trou Aux Biches, Le Victoria and Paradis. There is so much fun for the children - it is one of the few luxury places in the world that welcome children with open arms. Activities including shell decoration, aquagym, Sega football, painting, water polo, sailing, tennis are typical of what the clubs have to offer and children can take part in as many or as few as they wish. In addition to the above the clubs have swings, slides etc. There is a Bob Marlin Club at all of the resorts**with suitably qualified staff to ensure that the children enjoy the holiday to the fullest. Kids clubs are open all year round and are divided into different age groups. i.e 3 - 6 years and 7 -12 years. Opening hours are 9 a.m - 5 p.m and 6 p.m - 9 p.m.
**Note : Royal Palm only operate kids clubs during European School Holidays. Full time professional instructors are available at all of the hotels to provide you with lessons in the sporting activity of your choice. There are various groups lessons provided free of charge, but for a small additional fee you may arrange private tuition at any time. and the warm, clear, turquoise, waters of the Indian Ocean.